I have been in the “Outdoor Business” for well over 45-years. I’ve had my share of guiding as well. But after experiencing two outings with Mike Mladenik, I can truly say he is one of the best, especially when it comes to finding trophy smallmouth bass. A day on the water with Mike is a true angling educational experience! If you enjoy smallies, this is the guide for you! (Mike Jackson is a member of the National Freshwater Fishing Hall of Fame, as a Legendary Communicator. He has been the outdoors writer for the Daily Herald, one of the three major, Chicago-Metro, daily newspapers. And for over 40-years, he’s hosted the nationally acclaimed outdoor, radio talk show, Mike Jackson Outdoors). We have had the pleasure of fishing with the author Mike Mladenik twice and enjoyed it so much that we arranged for our son and grandson to fish with Mike…he is an excellent guide…he knows the area very well…his description of some of the characters who have hired him as a guide was hilarious….I recommend this book for those who do enjoy fishing and would highly recommend booking a fishing experience with Mike …you are bound to catch some fish with him enjoy his stories as well. When a Canadian fishing trip was unexpectantly canceled, I searched for a guide closer to home. Eleven years of incredible fishing later, I’ve not re-booked that Canada trip! Mike Mladenik teaches me something new every time I fish with him. The things he’s taught me are alone worth the price of his guide fee, much less the sheer numbers of high quality fish he has helped me catch and release through the years. Mike will not only help you catch fish, he will educate you about the river environment and the need to protect and conserve the unique fishery he knows so well. Mike’s patience and sense of humor serves him well as both a guide and an author. Reading his humorous book, “It’s All in A Day’s Work,” gave me new appreciation for the multiple skill sets I never knew were so necessary to being a successful fishing guide! Give this man a call before he retires from fishing to begin his next career as a Psychotherapist! Had a great day fishing with Mike ! 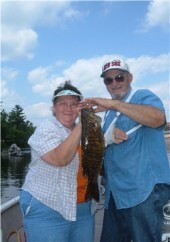 Caught 2 big smallies 4 plus lbs and 20 other nice ones! 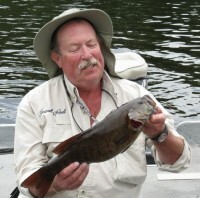 Great guide who knows the water and what baits to use. 8 hours of fishing just flew by. Can’t wait to book a trip next year.